In 2012, I invented this cruelty-free vegan blood sausage recipe. 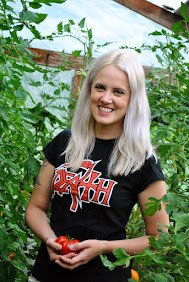 It's been popular on my Estonian blog, but I really wanted to share it with you, too. There are actually three people involved in this recipe. One blog reader asked me if I could create a sausage recipe with black beans. Then I instantly thought of making vegan blood sausages. The only problem at the beginning was to figure out what to use instead of the guts to hold the sausage together. My fiancé came out with an idea to use nori sheets instead. I was a bit skeptical, since I was afraid the taste of nori would be too strong but that wasn’t the case at all. They fit perfectly. They are black (just like the original sausages) and get extra crispy when greased and baked. So imagine crispy vegan sausages filled with delicious flavorful herby barley and onion filling and serving it with lingonberry jam or cranberry sauce, potatoes and gravy. You can find this recipe and many other delicious vegan recipes for entertaining in my one and only English cookbook "Vegan Dinner Party". And don't forget to check out more vegan Christmas recipes on this blog, including my other huge favorite - homemade seitan steaks! Tip: You can use porridge made of raw buckwheat groats for a gluten-free version. Boil about a cup of (cracked) barley groats until completely soft. Heat up a pan, add oil and finely chopped onions. Add a pinch of salt and cook for a couple of minutes. Add dried marjoram, ground nutmeg and dried rosemary. Stir and cook for a minute. Remove the heat and add the pan-fried onion mix to the boiled barley. Drain and rinse the black beans, mash with a fork and add to the boiled barley as well. Add flour and soy sauce to taste (I used a few tablespoons). Now really taste the mixture. It has to be flavorful. Add more soy sauce, if needed. 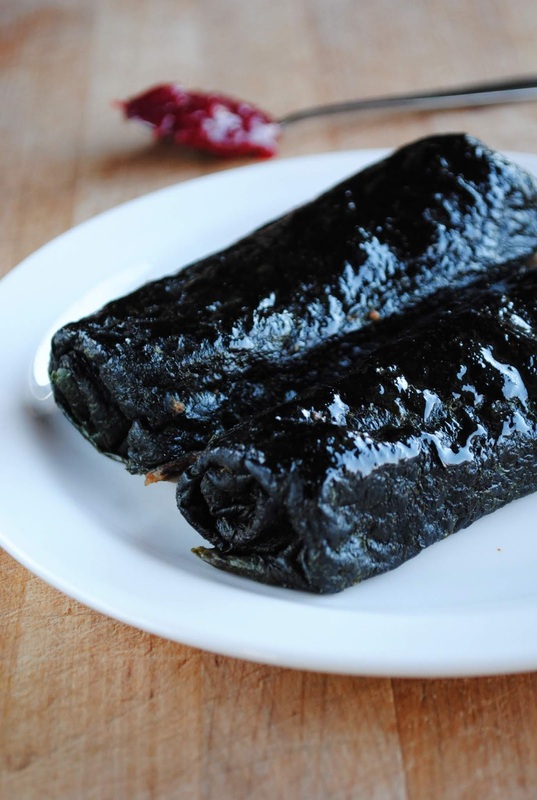 Take the nori sheets and spread about 1,5 tablespoons of barley filling evenly onto each nori sheet. 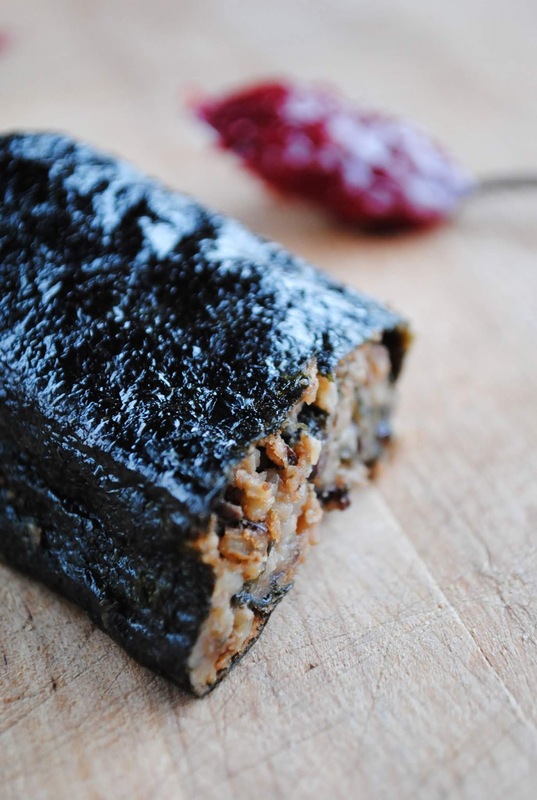 Turn the left and right side of the sheets inside (or skip this step and just roll the nori to make a longer sausage) and roll the sheet into a sausage until your reach the end of the sheet. Continue the procedure with every nori sheet. Put the sausages onto a greased baking tray and brush each sausage with a little bit of oil. Bake for 15 - 20 minutes at 400 F / 200 C. When they start cracking, remove the sausages from the oven. They are also very tasty on the next day when warmed up on a frying pan with a little bit of oil.